If you are responding to a Bulletin or Notes via e-mail please take the time to delete all irrelevant text and images. Thanks. Canon 400mm f/4 IS DO lens with the 1.4 X II TC and the EOS-1D Mark III. ISO 200. Evaluative metering at zero: 1/320 sec. at f/8 set manually. Fill flash at -2 stops with the Better Beamer. When I opened this image in ACR, the whites showed up as overexposed. They were easily recovered using the Highlight Slider (as detailed in Digital Basics and in the free excerpt on BPN (see immediately below for details and the link). 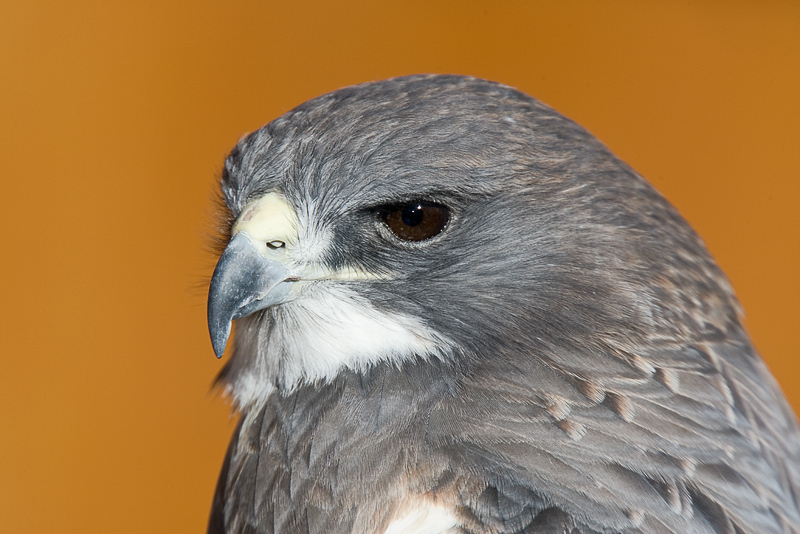 When photographing captive birds, pay careful attention to the backgrounds. You can often change them simply by taking a step to either side as I did here to take advantage of a beautiful adobe wall. 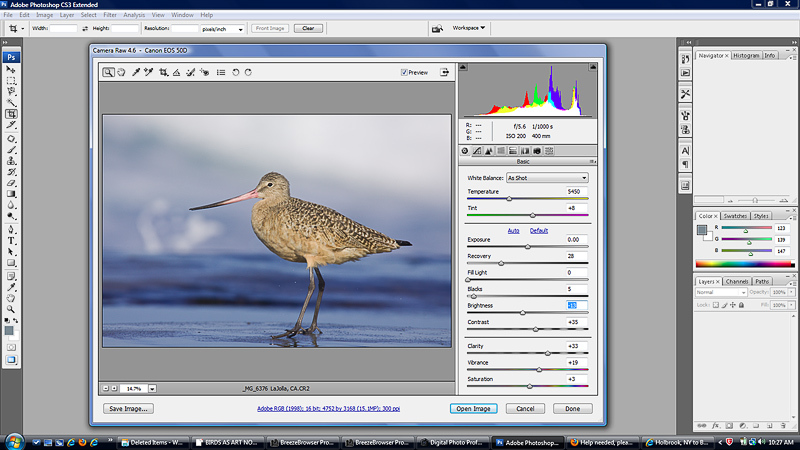 Here is a great BPN learning thread: http://www.birdphotographers.net/forums/showthread.php?p=398768#post398768. (Northern Shoveler by George Scott.) You can take advantage of the ACR converions excerpt by scrolling down to Pane #8 but you will learn a lot more by reading the entire thread. Do note that the lesson is still in progress. There are lots of other great threads in the ER as I like to call it. (t is BPN's most under-utilized Forum. And best of all, it is all free even to non-members. Many of the images that I open in ACR show clipped highlights as above--the red areas. 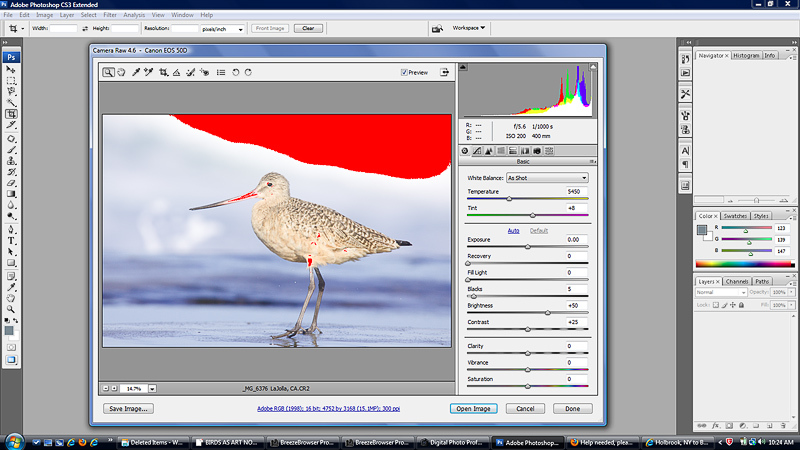 Note that the histogram shows the clipped highlights on the right. Unless you are dealing with a grossly overexposed image, the highlights are easily recovered by holding down the ALT key and moving the Recovery Slider to the right. You can find detailed instructions by following the first link in the item above. Or by getting your own copy of Digital Basics: https://store.birdsasart.com/shop/category.aspx?catid=32 and follow the link. 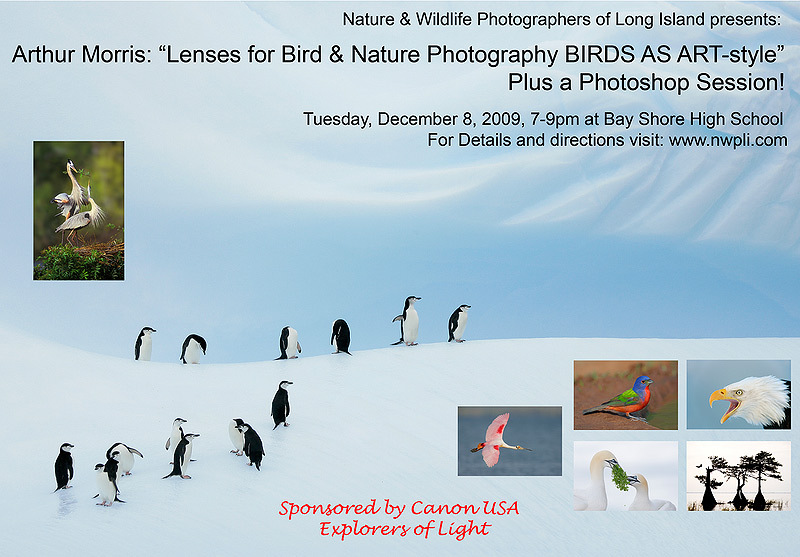 I will be presenting “Lenses for Nature Photography BIRDS AS ART-Style for the Nature and Wildlife Photographers of Long Island group in Bay Shore on December 8, 2009 at Bay Shore High School. After a short break I will present an optional Photoshop session for those who wish to stay on. For directions click here: http://www.nwpli.com/photo/calendar/#directions. This program is free and open to the public.